January 11, 2012, 12:46 PM · A violinist and pianist together can explore some of the finest musical repertoire ever written, and what an exciting road that can be. 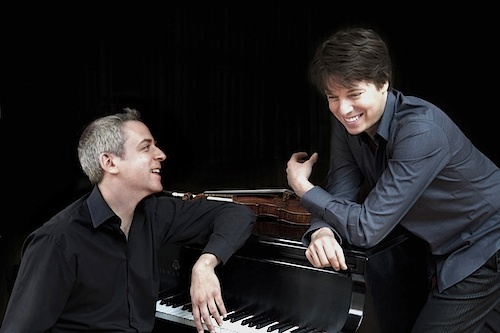 The road certainly has been exciting for violinist Joshua Bell and pianist Jeremy Denk, who have played some 80 recitals all over the globe -- fighting blizzards, braving U.S. airports, even showing up despite a major power outage -- during their seven-year collaboration. On Tuesday they released their first recording together, French Impressions, with sonatas by Saint-Saëns, Franck and Ravel. "Every piece on the recording represents piano and violin equally," says Joshua. As for his seven-year musical partnership with Jeremy Denk, "I love rehearsing with him, arguing him and thinking about what we are going to do. I will defend my ideas, and he will defend his. That's how you get into the truth of the matter, you might say. So it's a good partnership." Indeed it is, and these two give a stand-out performance in this recording of the Franck Sonata, which has one of the most difficult piano parts in the violin/piano sonata repertory. Because of his important role in this music, I wanted to speak with Jeremy Denk about the Franck, as well as his performing and writing career. Aside from his collaboration with Joshua, Jeremy regularly performs as a soloist with orchestras around the world. He also writes a blog, Think Denk, which he started in 2005 at the request of NPR Music Executive Producer, Anya Grundmann. He was working with Anya on some programs for Performance Today when she called him and said, 'You have to blog.' Jeremy started a blog that day. He also wrote the program notes for this CD (highly recommended reading for insights on the Franck, Saint-Saëns and Ravel Sonatas), and he has at least one more writing project in the works. Born in Durham, N.C., Denk started playing the piano when he was 5, and by the time he was 13 he was getting together with friends to play chamber music. "There were a bunch of us little nerds out there in Las Cruces, New Mexico, and we used to get together to learn things like Brahms piano quartet, and the Schubert Trout." He started at the Oberlin Conservatory at age 16, and he supplemented his piano lessons with a lot of collaborating, benefiting from non-piano teachers such as Norm Fischer (cello), Stephen Clapp (violin), Greg Fulkerson (violin), and more. He graduated from Oberlin with a degree in piano and chemistry, then earned his master's degree at Indiana University and doctorate at The Juilliard School. Jeremy points out in his program notes that both he and Joshua associate the Franck Sonata with their time at Indiana University -- for Joshua, because the piece was written as a wedding present for Eugène Ysaÿe, who taught Josef Gingold, with whom Joshua studied in Bloomington. For Jeremy, it was because of the inspiration he took from his piano teacher György Sebok. "It's a wonderful, wonderful, wonderful piece," Jeremy said. "I've had a long affection for it, especially ever since I heard Sebok play it in Bloomington with János Starker. Everyone was talking afterwards about Sebok's first four bars, that they were the most beautiful bars ever played." I realized, as Jeremy described this concert, that I had been in that audience, at the very same performance in Bloomington, when I was also a student there in the early '90s. It was one of the most moving and memorable performances I've seen -- of any piece. And I hadn't until that point realized that the Franck could be played on the cello! "When they played together it was always something very special," Jeremy said. "I don't think they rehearsed very much, but they both knew each other so well. Josh and I have played together for seven years, but had been playing together since the 50s. That's four decades!" In his program notes for the new recording with Joshua, Jeremy describes French Romantic music in terms of the French Impressionist painters: "The Impressionists did paintings, for instance, of a hay bale in a field…not to create a life-like landscape, not primarily to paint the thing, but to paint the light falling on the thing…the point being, there is no such thing as just a field with a hay bale in it, everything we see is colored by color." Similarly, Franck casts the Sonata's various musical themes in different light throughout. "It is sort of this enormous drama of color," Jeremy said to me as we spoke over the phone on Sunday. "Color becomes not just a decoration, but an essential part of the meaning of this music. Light vs. dark -- it's beautifully balanced and worked-through in that sonata. As a pianist, you have to be thinking constantly about the nature of the colors you're making, and of the place that you're in, in the larger drama of the piece. Sebok used to talk about Franck's spirituality, and also even Liszt's, in these sorts of pieces, which are sort of titanic struggles between good and evil, or joy and sadness." Also, for the pianist, "it's a pretty colossal piano part. The violin and the piano are waged in, not exactly a war, but a kind of a profound, often difficult dialogue with each other. Even in the first movement, the violin has the first long sentence, then the piano has a very long, different idea in response. You have to have a tremendous emotional presence and a great emotional investment in the piece. Because of Franck's idiosyncratic writing for the piano, you have to do a lot of fancy footwork to get around just the notes themselves. He loved to have very large chords, very large stretches and a very large distance for the instrument to cover." "He was an organist, yes," Jeremy said, "and sometimes it feels like there's a part that you would play with your foot! The chords are often slightly larger than my hands can normally accommodate. But that's part of the style." For the violinist playing the Franck, it's important to "be attuned to the working of the bass line. Because Franck was an organist, every motion of the harmony is -- not just significant, but signifying. It has almost symbolic resonance. So how you play the melody line is going to be very profoundly influenced by how you understand the motion in the bass. That can be a complication in the first movement. The violin melody seems so self-sufficient, but there are shades of light and darkness in the piano harmony that you really have to pay attention to." How have he and Joshua kept things harmonious, over the years, and over several 30-concert tours? It helps that "we're very independently minded on tour," Jeremy said. "Josh has always got a group of people who he's meeting, and I always like to practice and then watch HBO and go to bed so that I don't collapse in the middle of the show." There's always the struggle to keep up with 'real life,' and that can be a little complicated when someone else is always in the car with you. "When you're traveling, you have to always be on the phone to keep your regular life in order." "But then, once we would slip into the routine of playing that many concerts, it's self- sustaining, " Jeremy said. "After that first week, which always felt a little weird and exhausting, then I would sort of get into the groove of it." And then there's the music-making. "Josh is a tremendous, communicator, and he has a tremendous ability to let the music kind of soar and fly," Jeremy said. "I think the audience can really understand the story he's telling, and it's easy for them to be swept up in it because he works so much for that quality of playing. Josh has great judgment for what catches the ear and what will not. That's a powerful thing. I've learned a lot from him, playing all these concerts, listening to what he will do at certain moments when he perceives that the moment is flagging, what he does to reinvent, in the moment." I asked Jeremy what advice he has for young violinists who are just beginning to work in chamber situations, or with a pianist. I already knew this much on my own: if you view the pianist as a background person who is just plunking out some harmony behind the spotlight in which you stand, you won't likely benefit from the arrangement. Nor will the audience! "If you're playing a Beethoven sonata, or the Franck Sonata, or even the Saint-Saëns… a vast amount of the actual music is in the piano part," Jeremy said. He suggested finding a pianist who inspires you, and vice-versa. When it comes to communicating, "I often see people get into the trap of arguing a lot about certain points, or trying to turn every musical point into an either/or proposition. And that is often a very unproductive way to go about it. It leads to a lot of problems." What is the best way to bring up a musical idea, or difference, without offending each other? "When I'm working with my colleagues, I try to avoid any kind of blameful language," he said, laughing. "It's definitely not about blame. For me, you can talk until the cows come home, but I find the most effective way to get someone to play something the way you want it is to play it incredibly beautifully for them, the way that you want it, so that they hear it and they say, 'Oh yes, that sounds fantastic, let's do that.' That, for me, is the ultimate solution to all musical arguments." "Also, you have to be willing and open enough to listen to other people's beautiful playings of things, and to say, 'Oh yes, that is beautiful and I want to do that,'" he said. "That is the complicated, two-way street of being a good chamber musician. If you're more consumed with making the music sound wonderful than making yourself sound wonderful, then all of this should follow." January 11, 2012 at 08:38 PM · Bell performed the Bruch concerto last night with the Seattle Symphony. It was breath-taking! Then, for an encore, he played a movement from Ysaye's unaccompanied Sonata No. 3. My friend next to me said, "it's surprising that he didn't set his violin on fire". Truly a wonderful evening. January 16, 2012 at 05:42 PM · Laurie, wonderful, fresh, thoughtful writing....I especially liked the part "I realized, as Jeremy described this concert, that I had been in that audience, at the very same performance in Bloomington, when I was also a student there in the early '90s," as well as that on the Sebok-Starker collaboration.